Deer grass is native to large areas of the west coast from west central Oregon south through California. 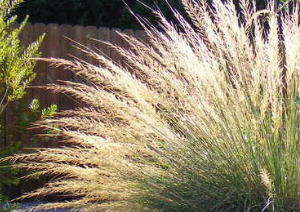 Its a tough and wild looking grass that peaks in autumn with a crescendo of dramatic flowers. Dense and fountain forming evergreen grass. Foliage to 2′ x 3′ very quickly. In autumn spikes of light tan thin but feather columns emerge and point out in every direction. The rise to about 5′ tall and remain as stiff skeletons well into winter. Full sun to very light shade in any soil that drains. Excels on slopes and raised beds. Wonderful lining a path or mass planted. Water to establish the first season then none in subsequent years. Its fully adapted to our dust dry summers. 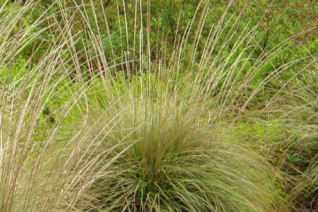 Very wild looking grass which can be tamed somewhat by planting in rows or symmetrical pattern. Otherwise it fits in perfectly between drought tolerant native shrubs like Manzanita and Ceanothus. Oregon native plant.